Finance Minister Arun Jaitley on Saturday said the Goods and Services Tax (GST) Council has cleared the draft compensation law -- one of the four enabling laws under the GST constitutional amendment - and hoped the remaining ones will be cleared in the next meeting ahead of the second half of Parliament's Budget Session. "The GST's compensation law states that if any state suffers loss it will be covered in first five years. Its legally vetted draft came before the Council and was the first law formally passed," Jaitley said at a press conference in Udaipur. Jaitley said he hoped the drafts of the remaining iGST (integrated GST), sGST (state GST) and cGST (central GST) laws will be passed in the Council's next meeting slated for March 4-5 in the national capital. "Once all drafts are approved, we will place them in Parliament. In Budget Session's second half (that begins on March 9), all enabling laws under GST constitutional amendment should get approved," he added. While legal vetting of the draft laws, some issues on the delegation of powers, exemptions during transition phase, work contracts, definition of agriculture, etc. were brought before Council. "Today GST's legal committee sought explanation on these and the Council gave its opinion. These now have to be incorporated in the draft laws. 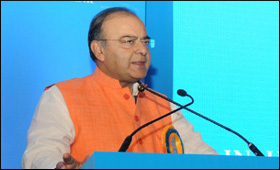 March 4-5 the legally vetted drafts of these laws will come before the Council, which it will try to approve," Jaitley said. The draft laws once passed by Council, will have to be passed by Parliament. Simultaneously, sGST will have to be passed by state legislative bodies. Jaitley said after that the next step will be to slot commodities under the GST tax slabs. "Each item has to be fitted under a particular slab. After the March 4-5 meeting, officers will start slotting the commodities and we will require another major meeting to give approval to the specific items in each of the slabs," the Finance Minister said. Govt. must seriously consider slashing GST (earlier Service Tax) to single digit, say 5 or 6%. Even for services on Medical. Earlier ST was 10.2%, then 12.36, 14, now 15%. If Govt will insist on 18% it will create too much of damage and making bigger holes in the pockets of upper medium class down to lower income parents and individuals. When such a huge % tax is levied many are following the 'no bill' business. People like us who doesn't agree with 'no bill' business are losing money as most times we accommodate them by charging fees including tax. In other words we absorb the damage. Govt. must think of ways of how these malpractices can be curtailed by taking such positive measures. If so, more people will pay GST for the above and Govt will surely end up collecting more money in the exchequer as a total.